Andrew B. Spurgeon works directly from the Greek text of 1 Corinthians in a study of reverse-contextualisation, highlighting the commonalities between the contexts of Corinthian and Indian cultures and applying the epistle's principles to Indian Christians today. In this unique commentary, Spurgeon first presents Indian similarities to those in Corinth, moves on to biblical principles the Apostle Paul raises for the Corinthian church's attention-especially where culture was in conflict with biblical standards-and finally reapplies these principles to the context of life in twenty-first century India. This is an excellent resource for anyone wishing to study 1 Corinthians, showing that God's Word is not only true, but is just as relevant centuries later as when it was written. 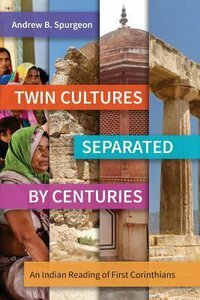 About "Twin Cultures Separated By Centuries: An Indian Reading of 1 Corinthians"